If you publish metadata, G/Technology creates a set of .raw- and .ddc files, the metadata to be stored in these tables/ddc-files is read from table G3E_METADATAKEYS. This gets truncated and filled during the metadata-publishing process by procedure MG3EPopulateMetadataKeys. This blog-entry describes how to extend the G/Technology metadata system with your own tables. If you now publish metadata, you will find .raw files PLE_METADATASUPPORT_OPTABLE.RAW & PLE_COMMONATTRIBUTES_OPTABLE.RAW where the latter contains the information needed. 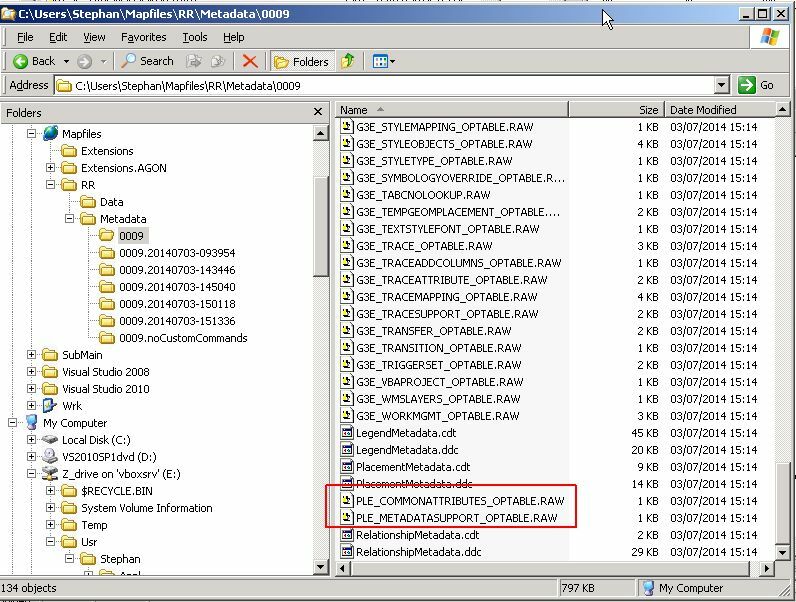 As always, metadata information is actually published twice, in the form of .raw files but also in one of the .ddc files. In this case, the information is also present in Analysis.ddc. The scripts for this sample can be downloaded here. This entry was posted in G/Technology, Intergraph, Metadata. Bookmark the permalink.